This review will contain a SPOILER and a NON-SPOILER section! You will be warned throughout each section so even if you didn't read the book yet, don't worry! You can still read the review! Harry Potter and the Cursed Child! I seriously didn't think this day would ever come! This book is a story that takes place 19 years later, after the events of the seventh book. 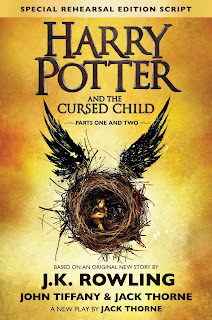 It follows the story of Harry Potter himself and his son, Albus, who has to carry the weight of being Harry Potter's son! This book is in script format, which I already knew about when I was going in to the book. Honestly the script format didn't bother me as much as I thought it would. I adapted to the script format pretty quickly! There were lots of plot twists here and there and I loved getting to see the beloved characters from my childhood again as adults! 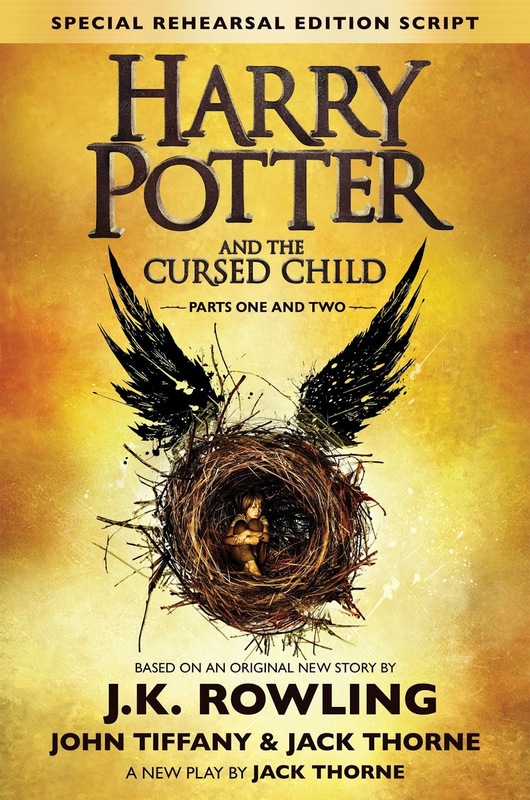 Now, did this book have the J.K Rowling magic the past seven harry potter books had Sadly, no. We have to remember that this book isn't written by J.K Rowling, but only based upon her stories of Harry Potter. it is written by a completely different person, Jack Thorne, so of course he couldn't capture the magic that Rowling was able to. The writing of the script didn't attack me with feels the way Rowling's writing did, but did that mean the story and the writing was bad? Not at all! I really enjoyed this book! I read this book in about a good four hours and I am writing this review right after I finished the book! I rate this book a 4/5 stars! I loved getting back in to the wizarding world and seeing all of the characters! I feel that this book really helped us get over the series in general you know? So this book was full of NON STOP SURPRISES! 1. I mean like seriously! First of all, Albus, Harry Potter's son, being in SLYTHERIN? I mean that was totally unexpected! I mean maybe I should've seen it coming since Albus was so worried about what house he would be put in before he went to Hogwarts. 2. ALBUS AND SCORPIUS! Omg I totally didn't see their friendship coming! I absolutely loved the connection they had especially because they were both going through similar situations with their fathers! They were both lonely and felt pressured by their dads of some sort nd I loved how they confided in each other for help! 3. ROSE GRANGER WEASLEY...Um...I was kind of disappointed about her in this book because we just really didn't get to know that much about her! I mean, other than the fact that very much like her mother, Hermione, she loves school, learning etc. we really didn't get that much about her! I also didn't like how judgmental she was against the Slytherins! I mean, she had good reasoning but Albus had a good reason to hate the Slytherins at the beginning of the book and did he? Nope. 4. CEDRIC DIGGORY??? Okay, so I read the HP series when I was a kid so I never really cared about Cedric Diggory that much! I mean, everybody around me was talking about how great he was and I was just like "UM...yeah" To me, he just didn't affect me that much as some of the other characters did. I REALLY didn't like Amos in this book. Sure, Harry had some relevance to Cedric's death. But you can't really blame for Harry for all that has happened! 5. TIME TURNING...Okay, so this is where things get super messed up! When Albus and Scorpius tried to use the Time Turner to save Cedric, I was like "NOOOO" because I knew it wouldn't end well! And they kept on messing up OVER AND OVER AND OVER AGAIN! The book really scared the crap out of me when Albus and Scorpius messed up the timeline so that Voldemort won the battle of Hogwarts and the whole world was dark and AHHHH. 6. DELPHI...Well that crazy (I can't cuss here right?) "brat" turned out to be freaking VOLDEMORT'S DAUGHTER! Oh and guess what? Her mom is Bellatrix Lestrange! I seriously never saw that coming! I don't even want to think about it...like, seriously yuck. Anyway, I never really liked her but when she tried to fulfill her stupid prophecy to help her father, things get even messier! But thankfully, Scorpius, being the nerd he is and Albus being so brave helped Harry and the gang find them in the timeline and they all defeated Delphi together! 7. ROSE AND SCORPIUS? ALBUS AND SCORPIUS? Okay, so the HP fandom is officially going crazy because some people ship Rose and Scorpius and some people Albus and Scorpius! I honestly didn't feel a special connection between Rose and Scorpius! I mean, yes, Scorpius was drooling after Rose since the beginning but Albus and Scorpius had so many moments together throughout the book that screamed a little more than bromance. But the book seems to hint that they are both in to girls, so whoever Scorpius and Albus end up with, I'll be happy with it! Overall, I loved this book! I think it was a good wrap up to the amazing series and I feel like this book gave us a more final goodbye. Like, you know what I mean? I could say goodbye to the characters more easily knowing and going through their lives 19 years later! This series is a true legend and I loved every part of it:) I would gladly read the series and this book all over again! NOW WE JUST HAVE TO WAIT FOR THE MOVIE, FANTASTIC BEASTS AND WHERE TO FIND THEM!!! Summer Reading: How did it go?